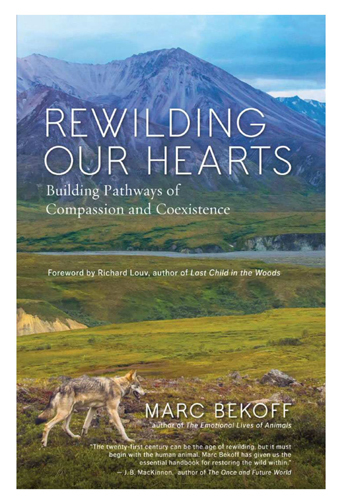 Rewilding Our Hearts by Marc Bekoff makes a case for the importance of loving the natural world and describes ways we can invite the wild into our lives. Bekoff notes that many of us invite the wild into our homes in the beings we call pets. Some of us visit parks and zoos to make those connections. Or we may go outside to fly kites, or go skiing, hiking, or feed birds in our yards. For those who haven’t heard of Bekoff, he’s a scientist who studies animal behavior through observation, a discipline called ethology. He has worked closely with Jane Goodall, written a lot of books (a few of which I have read), and writes a column on animal emotions for Psychology Today (animal rescuers reading this might find his recent column, “Empathy Burnout and Compassion Fatigue Among Animal Rescuers” interesting). For me, the book confirmed a course I was on and gave me a name for what I am doing. Bekoff’s book helped me understand the effects of what he calls “unwilding” in my life and to see the rag tag ways I was trying to address my need for connection to the wild. Through reading the book, I was able to become more systematic in my thinking, and maybe my actions. My heart is extremely open to hearing the animals, now I am working more effectively to help build corridors connecting the hearts of other humans to the isolated islands where my wild friends live. In Rewilding Our Hearts, Bekoff borrows from a conservation vocabulary in which “rewilding” refers to connecting isolated wild areas through corridors that large carnivores can pass through to move among wild areas separated from each other by human settlements. The theory posits that ecosystems need large carnivores to thrive, and corridors connect them with suitable prey and mates, allowing them to sustain themselves and the other species in their food systems. Bekoff applies the idea of corridors to humans and the natural world. We humans are increasingly cut off from wild areas and wild animals as more and more of us live in areas that are heavily populated allmost exclusively by humans. Although we lack access to wilderness, and for some, any sort of wild plants or animals, some psychologists argue that we actually NEED experiences of nature to be healthy humans. This is called “biophilia.” Studies suggest that we experience distress when we do not encounter enough nature. Rewilding helps us get healthier. Bekoff asks humans to appreciate, respect, and accept others – other animals, the land, plants – and rejoice in their multiplicities. Bekoff would like us to care for nonhuman animals and the natural world consistently, but some of us just don’t know the inhabitants of the natural world well enough to understand why we should have compassion for those who are not like us. Bekoff has arguments drawn from philosophy and science to guide readers into thinking differently about compassion. He points to studies in evolutionary biology that suggest compassion comes more naturally to us than some popular philosophers (like Ayn Rand, for example) would have us believe. In fact, he writes, observational studies are finding that groups of individuals who work together thrive together. These studies indicate that survival of the fittest may just mean survival of those who are best at working together. Bekoff calls upon humans to deepen our values of compassion and empathy to allow peaceful coexistence among species. Individual humans, regardless of their circumstances, can make choices with this pact in mind. Bekoff is mindful that the type of actions individual humans can take depends on our resources and location, among other conditions. While some actions require lots of resources, some do not. Some of the smaller decisions I make, for example, relate to animals I would rather not have inside my house. I can use a pesticide (this is an exceedingly rare choice in my house), kill the insect or other animal without chemicals, encourage the uninvited guest to leave, or capture and release the animal outside. (I have lots of stories about opossum babies, lizards, and insects who have ventured into my home and been returned to the wild outdoors.) I can spend 15 minutes outside or sit at the computer screen for (another) 15 minutes. I can look at pictures of wild animals and then learn about their needs and contributions to our world. Camera trap videos fascinate me. Have you seen the one of the bears scratching to “Jungle Boogie”? Or Chris Morgan’s lovely short film about capturing grizzly bears in a well populated area to move them into a critically underpopulated area to find mates. It’s only 13 minutes long. Reading Rewilding Our Hearts will require a longer commitment, and would be time well spent if you long to give nature a bigger place in your heart. 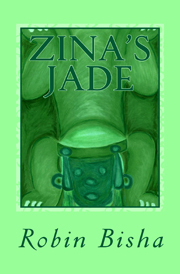 I read it on Kindle and it is available in paperback. 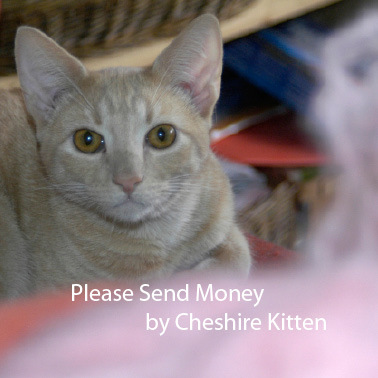 If you buy it through Cheshire Kitten’s Bookshelf, we will earn a little from the sale at Amazon. You’ll find a link in the “Wild Animals” section.